It's game day for Super Bowl 50. The Carolina Panthers and Denver Broncos are both champions already, of course. Of their respective conferences, that is. Today we'll find out on the field which champion gets the Lombardi trophy as league champion. The Zebras. A tribute to the crew that has been on the field for every Super Bowl. Yesterday we wandered around Fort Mason to see what was going on. Wheels Up took over one of the piers for a tailgate party. And ESPN was still broadcasting from the Marina Green. But tucked away in a corner of the Palace of Fine Arts we found the shot we wanted for today. It's a tribute to the refs. Officiating crews consist of seven officials who monitor each play, looking at the action differently. An eighth official reviews calls in the replay booth on demand and after the two-minute warning. And there are millions of game-day officials backing them up to make the call from their recliners if there's any doubt. It's a tough job. And the admiration we feel for these zebras before the game quickly evaporates with their first missed call that adversely affects our team. We don't have a horse in this race, so we're takomh the high road today to applaud the refs. 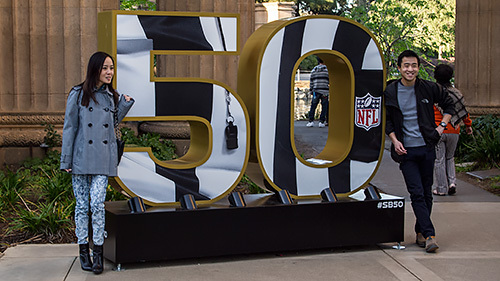 But the thought didn't occur to us until we ran across one of those Golden Fifty markers littered around San Francisco acknowledging the one team that's been on the field for every Super Bowl.